In our Google+ Community on digital portfolios for students, we have been discussing the pros and cons of rubrics. Yes, they spell out what is expected regarding a summative assessment for a unit of study. Differentiating between levels of understanding can help teachers more efficiently assess assigned performance tasks of student learning. For teachers who are now evaluated within the Danielson Framework for Instruction, the focus is on a rubric. So what’s the problem? Clear expectations and easy-to-apply assessment tools can make the learning lives of students and teachers more manageable. This may be exactly why there is a problem. Assessment is not an easy practice to apply. Expectations for what excellence looks like for student learning can become more confusing when we parse out an understanding of mastery in the name of efficiency. Plus, there is the debate about defining poor performance. How much attention should a “1” really be given? Why is a “1” (see: failure) even an option offered to our students? 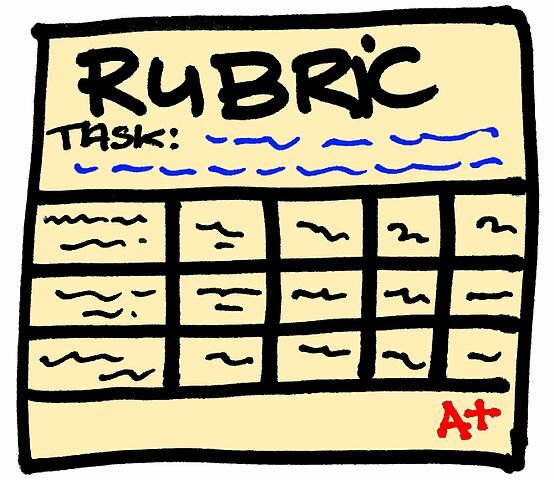 In this post, I propose three alternatives to rubrics when designing units of study. I am not anti-rubric; rather, we should consider the possibilities when designing instruction for deep student understanding and strong skill development. This approach works really well with skill-focused learning, such as writing. Showing students what is expected to achieve excellence with examples from past learners can have a better impact. 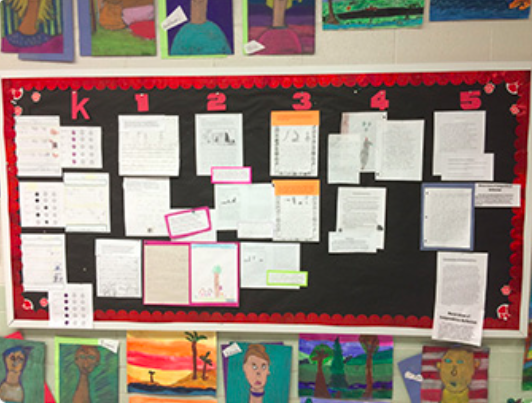 Below is an example: A mastery wall of student writing, compiled by grade level teams as a mid-year informative writing check. How might sharing and analyzing exemplary student work be an improvement over rubrics? I don’t know if you have noticed, but the Common Core State Standards, especially the literacy anchor standards, read like a rubric. Each phrase within the standard addresses a specific understanding or skill. Standards of excellence are paragraph-length descriptions of what a student should know and be able to do after a progression of learning activities. What is described is what is expected. Anything less is scored below a “4”, largely at the discretion of the student + teacher discussing the work. As an author, craft an original story, real or imagined, that has a beginning, middle, and end. This story shall have an attention-grabbing lead, rising action that keeps the reader going, and a satisfying conclusion. It shall be free of confusing language and grammatical errors. In addition, your story shall be both entertaining and informative. How might crafting a standard of excellence be an improvement over rubrics? Both effort and skill development are recognized within this assessment. How might differentiating between novice and expert understanding be an improvement over rubrics? What are your thoughts on this topic of rubrics and alternative assessments? Please share your thinking in the comments. Thanks for this post. Although I too am not anti-rubric per se, I have lots of questions about what we may miss because in the work of our students because we may not be looking for these qualities since they’re not on the rubric! So, I too have questions about the effectiveness of rubrics and like the alternatives that you present above. Why we focus on a score of “1” or “2” on a rubric is something I’ve been thinking about for a long time, too thanks to the work of Canadian educator, Anne Davies. We want kids to meet and exceed expectations. If that’s our goal,why do we even bother with the lower tiers of a rubric? Of course, if we expect some kids to do well and others not to do well and then blame the latter group for not adhering to the rubric, then a 4-point rubric fits this mindset. We want better than that! The novice vs expert view above though only differentiates by quantity rather than by quality, which I have concerns about. Maybe there’s a way to rewrite the novice and expert descriptors so that they are more qualitative in nature. I will try that for sure. I am planning to use these options throughout the year. Thanks Elisa for commenting. 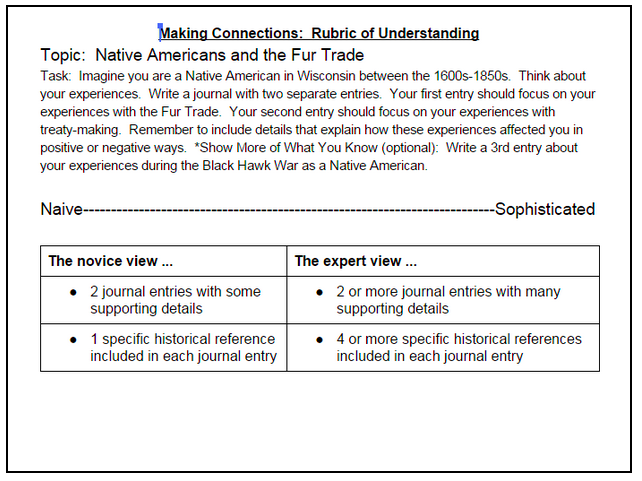 The novice/expert example is actually a first draft, created by a few of our school’s teachers. They plan to come back to it and make revisions in the areas you also reference. Next Next post: What questions should we be asking ourselves before assigning digital work to students?